Today’s business climate is a race to disrupt or be disrupted, or more appropriately, get on the cloud or get rained on. The ESG 2018 IT Transformation Maturity Study reveals that 81 percent of customers agree that “if my IT organization does not embrace IT transformation, we will not be a competitive company.” Our customers know that IT must transform in order to be seen as a strategic business enabler. As I visit a lot of our customers around the world, I have learned that HCI has become the new standard for most workloads, small and big, test dev or mission critical. 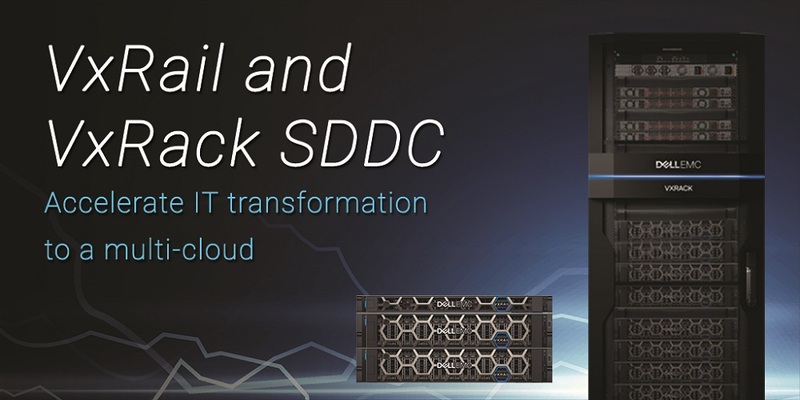 No matter where you are in your transformation journey, VxRail and VxRack SDDC allow customers to reap the benefits of both a hybrid and multi-cloud environment, by simplifying and extending VMware environments with scale-out, software-defined, and cloud-enabled technologies across servers, storage, and HCI systems. Fully automated and optimized for performance, scalability, and user experience, VxRail and VxRack SDDC are designed to support multiple workloads, and serve as the on-premises platform for private cloud environments. Through infrastructure modernization, a distinct path to hybrid cloud is created. IT can then provide the business with a self-service experience and exceptional speed to delivery with automation and lifecycle management. In just two years, Dell EMC has had remarkable customer adoption of its HCI solutions jointly developed with VMware, helping to solidify Dell EMC as a market leader in hyper-converged infrastructure (HCI), as recognized by both Gartner and IDC. VxRail and VxRack SDDC are the only HCI engineered systems powered by Dell EMC PowerEdge servers co-engineered and pre-tested with VMware. VxRail is the standard for rapidly and predictably transforming VMware environments powered by vSAN, and VxRack SDDC is the only rack scale HCI system architected in unison with VCF – making it the simplest way to deploy VCF. The continued market success of our world-class HCI solutions is achieved with the help of many including VMware, Intel, our partners around the globe, our Dell team, and most notably, our success is due to our customers who inspire our rapid innovation and demand our superior technology. You can read our full product announcement here. IDC Worldwide Quarterly Converged Systems Tracker, December 21, 2017.